Why has the appearance of Alberto’s photos changed to show a splay of the tail directly toward the Earth, rather than slung to the left as has been the mode for the past few years. When slung to the side, the tail with its individual Moon Swirls has been seen as long tubes or as bright orbs when the tubes were turned to focus light directly toward the Earth. This was recently apparent in the String of Pearls display, captured by Alberto. But what would happen if the tail were hosed more directly at the Earth? The long tubes and bright orbs would seem to disappear, while the debris in the tail would hose out in a splay. Imagine a fire hose of water seen from the side, and then seen when the hose is in your face. Why has this orientation changed, between the Earth and Planet X? We explained that during the 8 of 10, more visibility of Planet X could be expected. Planet X is approaching the Earth via a retrograde orbit, clockwise, where the Earth and all the other planets orbiting the Sun are orbiting in a counterclockwise manner. As Planet X proceeds past the Sun and outbound, it has pushed the Earth back in her halted orbit from the December position to the August position, and the Earth can go no further. While the Earth squeezes as far to the left as possible, in her trap, Planet X moves steadily outbound, coming closer to the Earth. Thus Planet X appears larger, closer, while at the same time further to the right. Nevertheless, the Planet X complex is still in the line of sight with the Sun. It has been, and continues to be, to the right of the Sun and at the lower right side, the 4 o’clock position when seen from the Northern Hemisphere. What has changed, in addition to the Earth squeezing as far as possible to the left, is the closeness of Planet X, which has moved outbound from the Sun. The massive debris laden tail of Planet X has been blowing toward the left, but this has been shooting between the Earth and Sun. Now, since Planet X has moved outbound, it is often directly hosing the Earth. This will bring changes on Earth, more EMP effect such as the one taking MH 370 down and disabling MH 066, but also more debris striking the ISS and mankind’s satellites and screaming through the atmosphere as bolides. It will also affect the nature of the Earth wobble, with the daily push against the magnetic N Pole of Earth more violent and the frantic attempts by the Earth to right itself afterwards, the Figure 8 swing round of the wobble, more extreme. Kojima has noted jolting on the seismographs for the past few weeks, and this is another result of the more violent wobble. Plates are literally thrown against each other, during the wobble, jostling each other like passengers on a lurching commuter train. I saw this article, where red dust has been appearing in the UK. It is being said to be Saharan dust, thrown up high into the atmosphere from a violent sandstorm, resulting in the sand mixing with water in the atmosphere and falling as dusty rain in the UK. 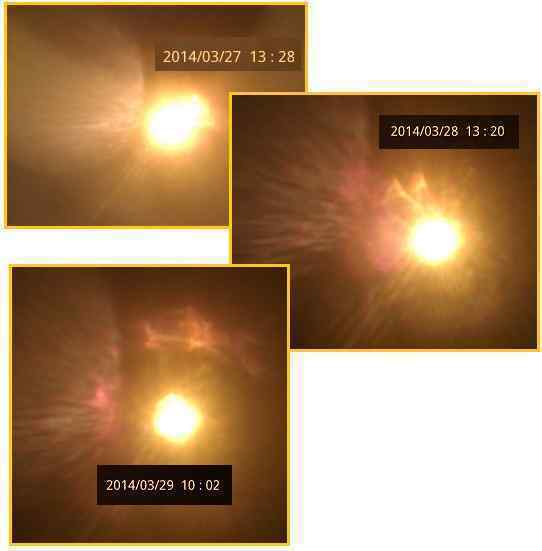 Now, is this really dust from the tail of Nibiru/Planet-X? Dust from the Sahara has been blamed on red dust appearing as far away as Texas in the past few years, such is the desperation of those still hoping to deny the presence of Nibiru in the inner solar system. 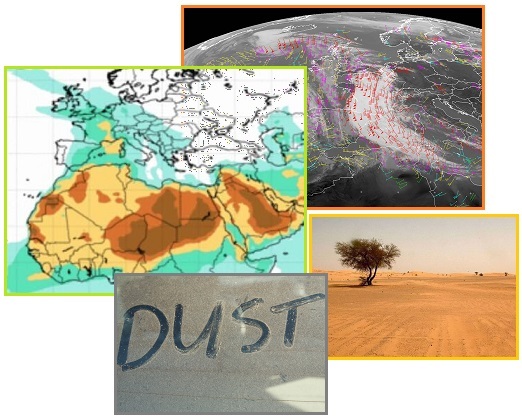 Where it is possible for sand storms to arise in the Sahara, the heavy dusting that is being reported in Europe at this time is not being carried afar by winds. Has this happened in past years, or past centuries? If this dust is from the tail of Planet X, which has recently been documented by Alberto’s photos as pointing more directly at the Earth, then why is the predominant color beige? The blood red dust of legend, turning ponds and rivers blood red, occurs closer to the time of the Pole Shift as the iron oxide dust is charged, and thus clings to the magnetic giant – Planet X – which is at the center of the magnetic attraction. At the far ends of the tail lie debris not so heavily charged, and this does not have the preponderance of the blood red colored iron oxide dust. As with other atmospheric changes – Moon and Sun halos and neon clouds and an increase in upper atmosphere lightning – the increased dust from the tail will be explained away by the media, which is controlled by the elite who are desperate to forestall rioting and panic in the people. Is this a case of another attempt on Obamas life, and further cleaning the ranks of Elite insiders? [and from another] http://www.news.com.au/world/barack-obamas-secret-service-agents-sent-home-after-night-of-drinking-on-amsterdam/story-fndir2ev-1226865630837 The incident happened before Obama arrived in the country and did not compromise his security in any way. All three were on the Counter Assault Team, which defends the president if he comes under attack, and that one agent was a “team leader”. One agent was discovered highly intoxicated by staff at a hotel, who reported it to the US embassy. The other two agents were deemed complicit because they didn’t intervene despite being in a position to assist the drunken agent or tamp down his behavior. This indeed was yet another attempt on Obama’s life, snafu’d by the angels standing in guard around Obama. Those intent on undermining the Secret Service protection got confused about the timing, and drugged the agent too early, thus exposing the plan. Their confusion on timing was not an accident, as benign aliens work via telepathy and can plant different memories or alter them. Thus, the screen memories given to contactees over the years to help keep their visitations in their subconscious. This interference with the free will of man is an exception granted by the Council of Worlds, who authorized Obama’s protection. Prior attempts to gain access to Obama have failed due to alert Secret Service actions, so in desperation the cover-up crowd planned to target the Secret Service. Were they drinking in the days prior to Obama’s arrival? No. Though the public will likely conclude this and the perpetrators were anticipating that finger pointing would go in this direction. An internal investigation will show otherwise, and exonerate the agents involved. Agents must eat meals and drink bottled water, all of which can be tampered with. In future, the agents, as well as Obama, will have their meals and beverages delivered from the US, making these kinds of maneuvers more difficult. In addressing this question we are not asking our Emissary, Nancy to become a mathematician, to learn all the terms used on the Earth Orientation website, nor to correlate the various measurements that go into a determination of the Earth’s orientation. The polar motion graph presented for our comments is based on X, Y locations clearly affected by the Earth’s seasons, making a circle during the year. 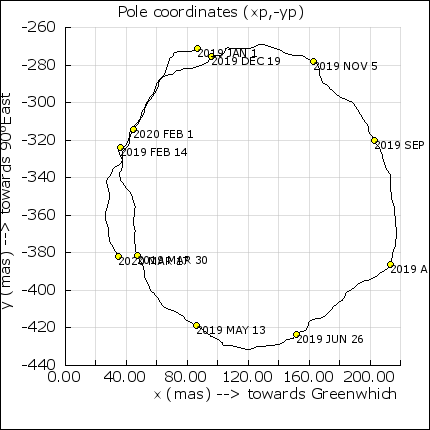 Since the start of 2014, this circle has changed shape, indicating that the measurement point has not pulled southward as the Spring progressed, the Earth’s geographic N Pole tilting toward the South, but rather remained as though in Winter. The wobble has worsened, as we have often mentioned, which means that the daily Figure 8 taken by the magnetic N Pole is pushed farther away, bounces back more aggressively, and the swings to the right and left are taking a wider swath. Human scientists, under pressure to disguise the effects that Planet X is having on the Earth, have been desensitizing equipment and altering data in a steadfast manner for the past 10-15 years. The USGS reduces the magnitude of quakes and drops them from its databases. The Magnetic Simulator is taken off line supposedly due to funding cutbacks, while BATRSUS as a substitute focuses on solar emissions rather than the Earth’s magnetosphere. The LISS seismographs were reduced in sensitivity and periodically taken offline, as they showed the daily wobble in the tugging on the Earth plates. 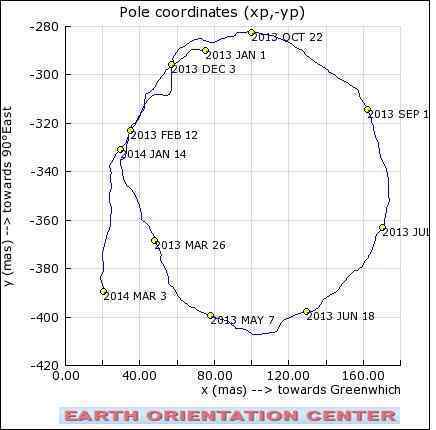 The Earth Orientation data was overlooked in all these maneuvers, but now that it has shown the Earth wobble the public can expect yet another source of proof of the nearby presence of Planet X, aka Nibiru, to be altered.